The Kid’s App was designed with the idea that parents and children should agree on the right amount of screen time. Kids love having the freedom to make choices. 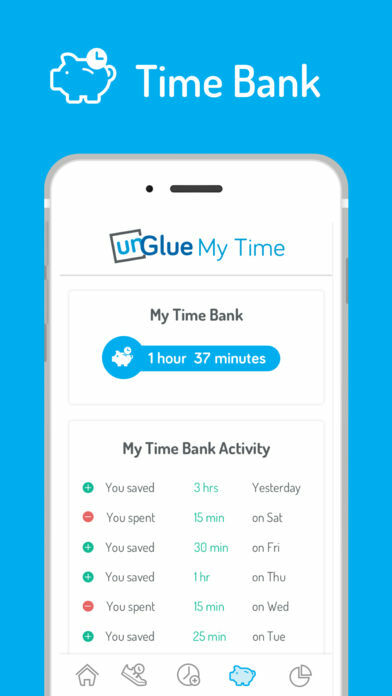 unGlue lets them track their own screen time, check their schedules, earn more time by doing chores, and even roll over unused minutes for another day. You set the limits on content and time. Encourage better habits by allowing your kids to save unused screen time for later — up to your maximum limit. Get your kids active again. Motivating your kids to get moving isn’t hard when you have the right bargaining chips: screen time minutes. With Steps4Time, kids can trade daily steps for screen time. It’s an easy way for parents to get their kids up and out of the house — not just glued to their gadgets. Desperate to end screen battles and get your kids off their electronic devices? unGlue Kids is an app designed especially for children and teens to learn healthier online habits and manage their own internet time. Here’s our pact to you - unGlue will help improve inter-familial relationships and prepare your kids for a lifetime of technology and time management. unGlue's Steps4Time feature integrates with Apple's HealthKit to track kids' steps over the course of the day. Steps are converted into entertainment time for kids' use, keeping your family happy, healthy and active. - Encourage an active lifestyle by earning more time through steps.